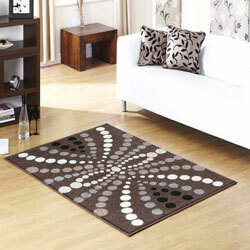 The Platinum collection contains a stunning range of rugs, perfect for a modern and contemporary interior. The neutral colours contained in the rugs, such as the browns, creams and darker blacks, will create a statement space, without being over powering. The simple line design will suit a variety of soft furnishings and accessories, so you will be able to switch it between rooms if you change your interior. These cheap rugs are made with high quality materials and are excellent value for money, as well as being colour-fast and durable, even in high traffic areas.